Click here to jump directly to the images below. In 1943 Jack Coggins received an invitation from Uncle Sam which he couldn't refuse. 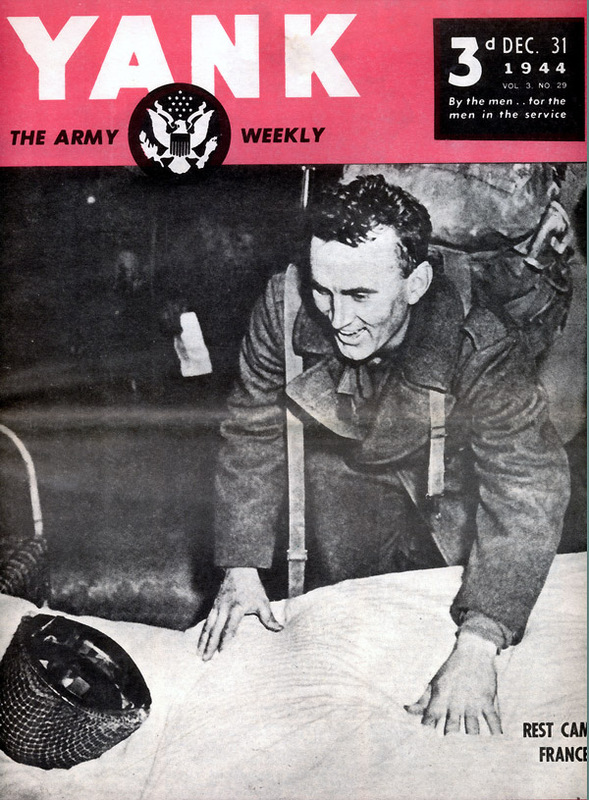 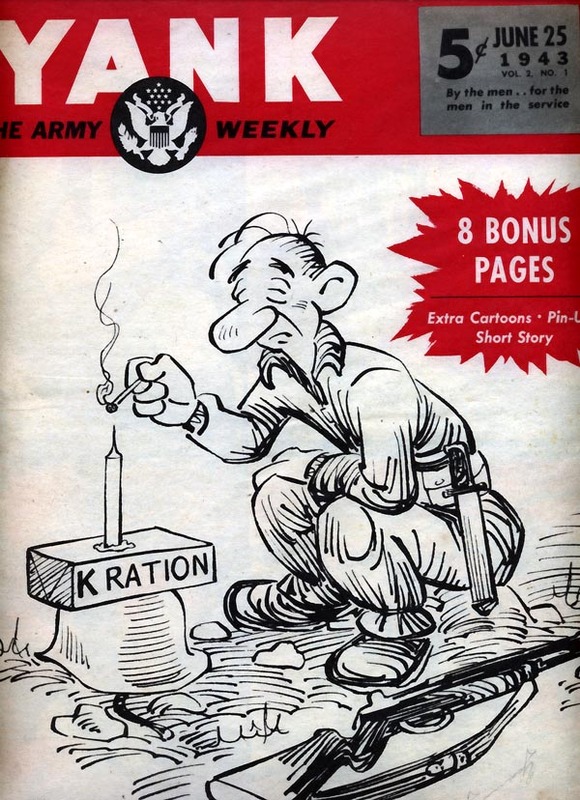 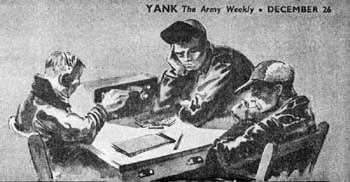 He was inducted into the U.S. Army on April 8, 1943 and served as a correspondent or staff artist for YANK magazine - written "By the men ... for the men in the service" - until the end of World War 2. 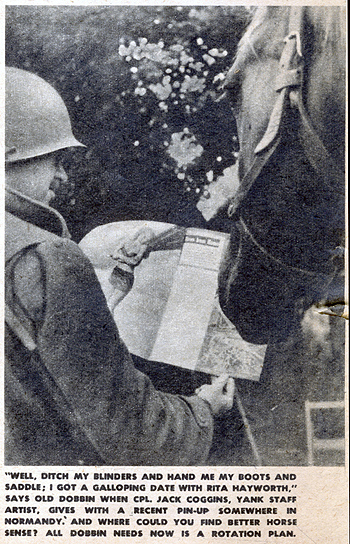 Jack's Military Records show that he served in campaigns in Normandy, Northern France and Air Offensive. He was awarded the American Campaign Medal, European African Middle Eastern Campaign Medal with 3 Bronze Service Stars, Good Conduct Medal, Meritorious Unit Commendation, WWII Victory Medal and Honorable Service Lapel Button WWII. Records from US National Archives are available here. 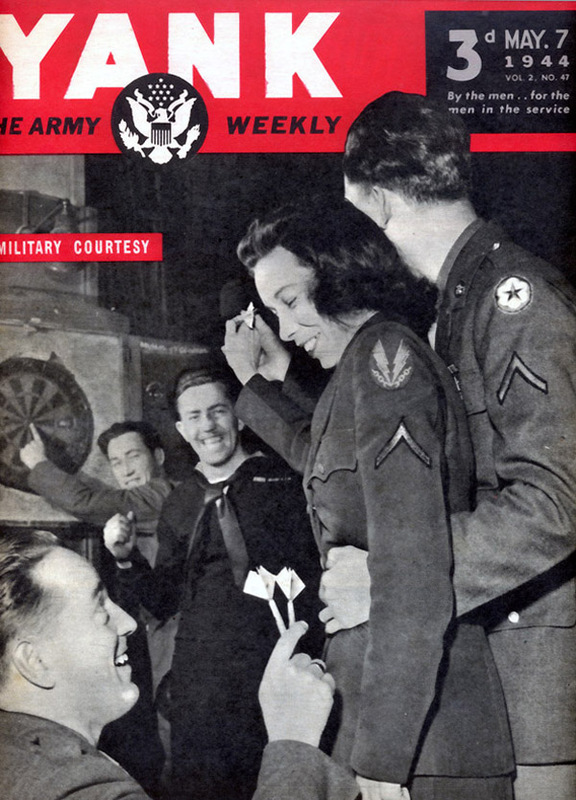 Jack was transferred from basic training directly to the New York office of YANK on May 20, 1943, reportedly at the request of the commanding officer, Col. Franklin S. Forsberg, who knew his work from Life magazine. 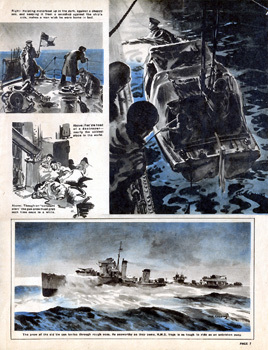 The earliest example of Jack's YANK artwork I have found to date was produced in the New York office and was published in late June, 1943 in Volume 2, No. 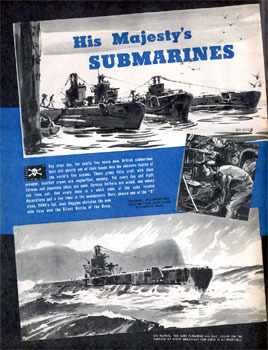 1 of both the US and British editions. 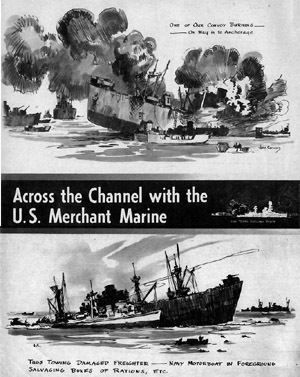 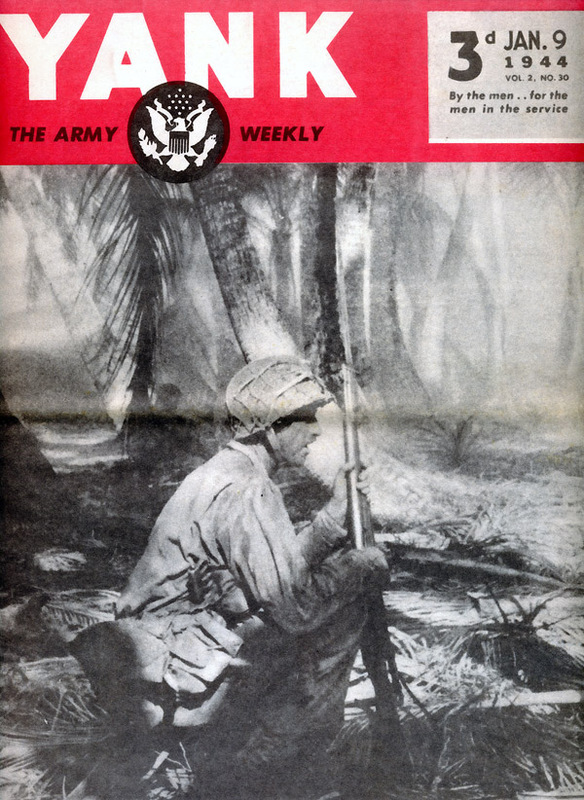 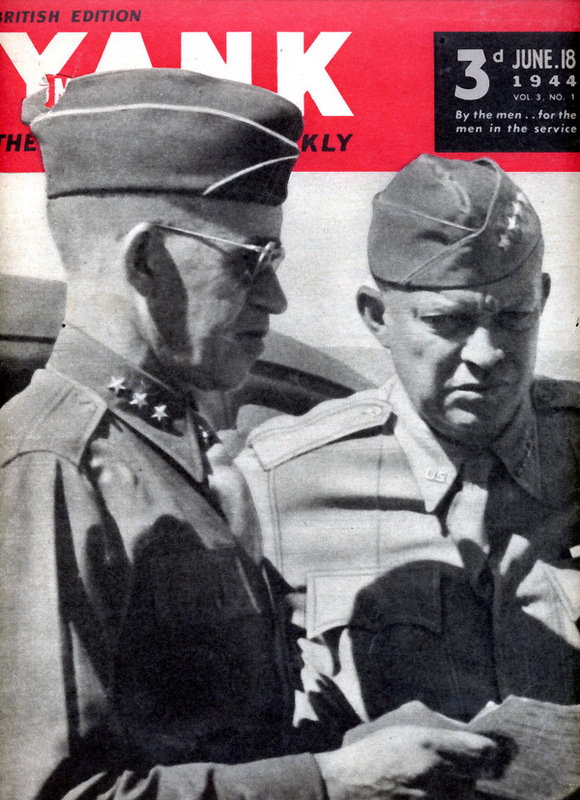 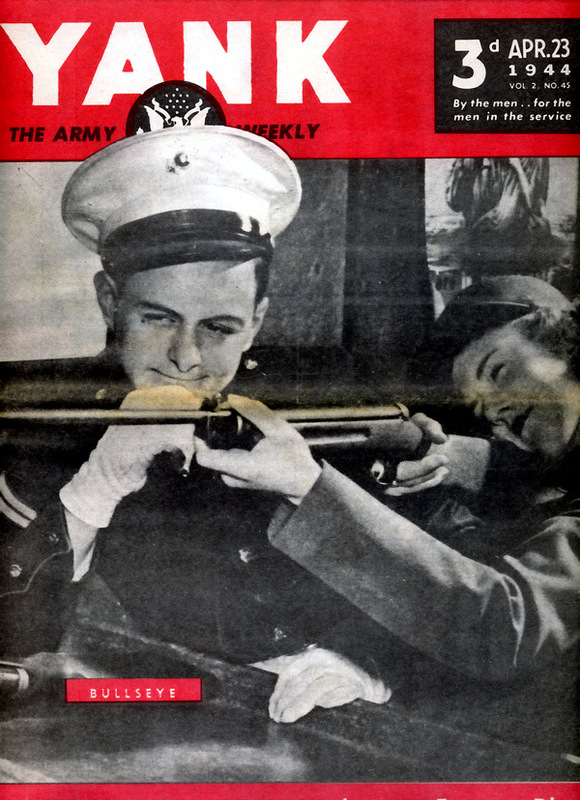 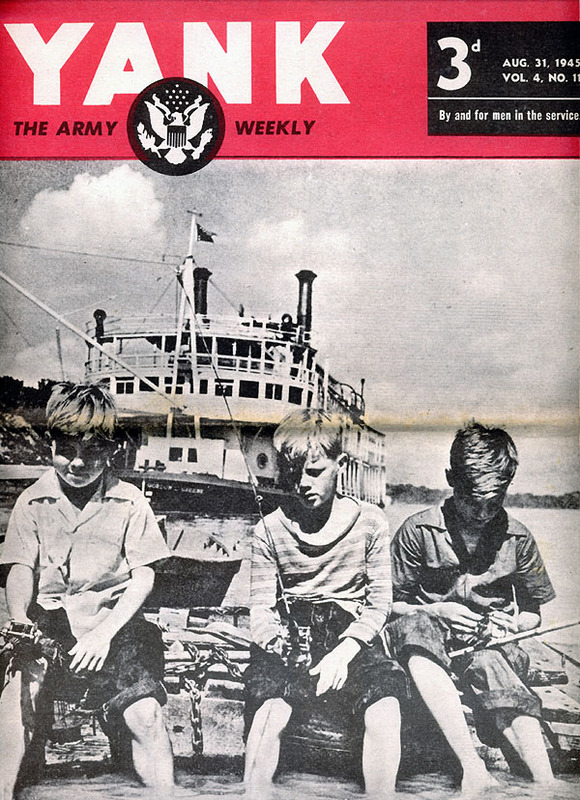 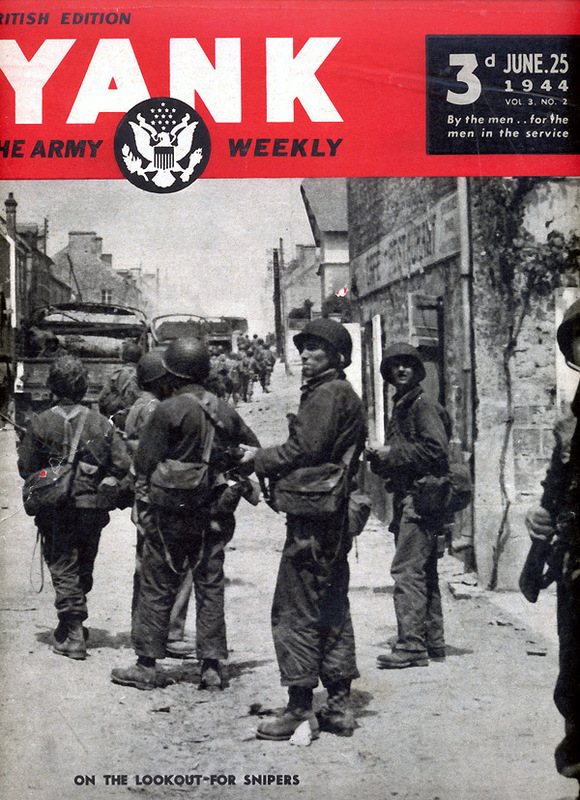 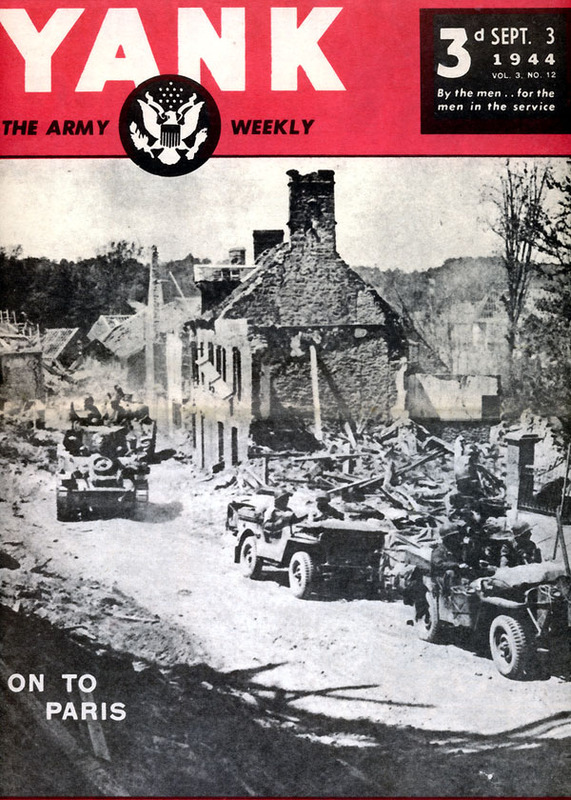 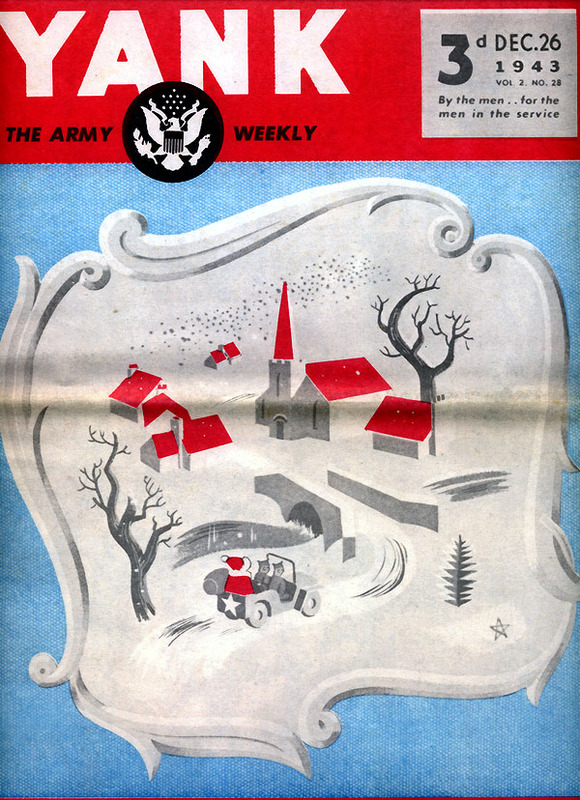 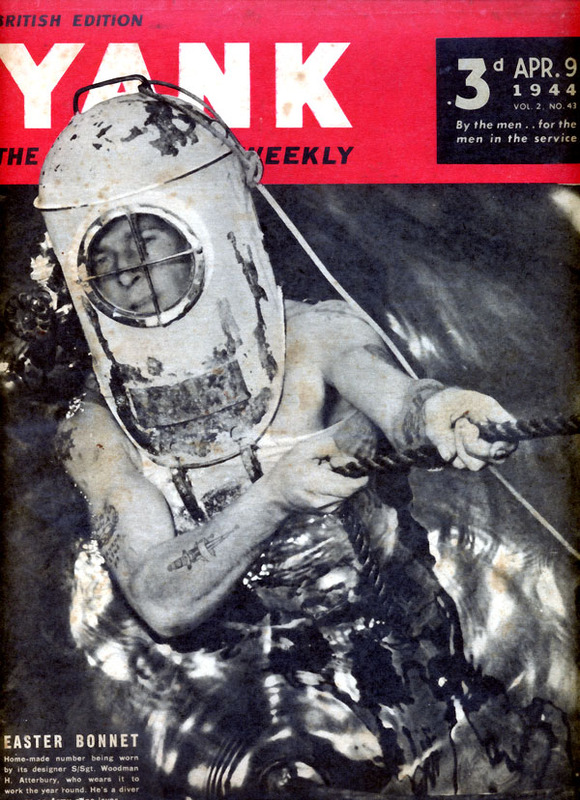 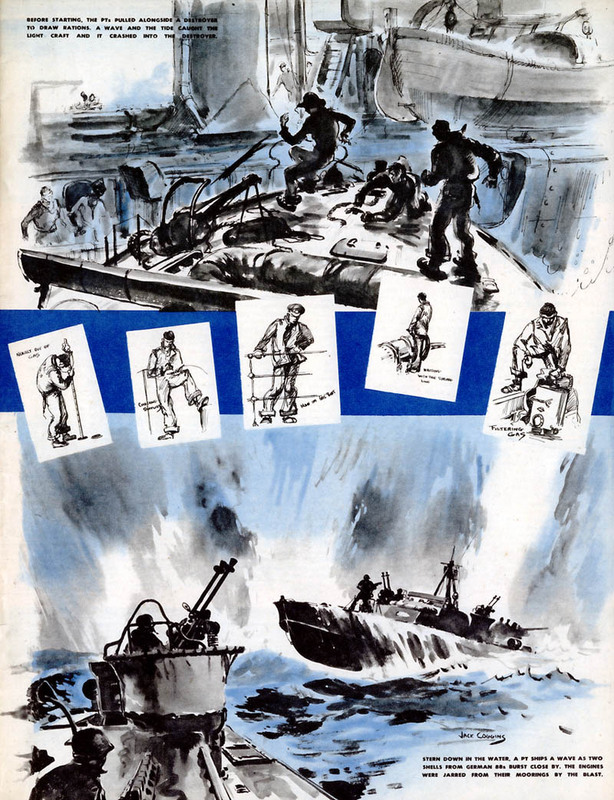 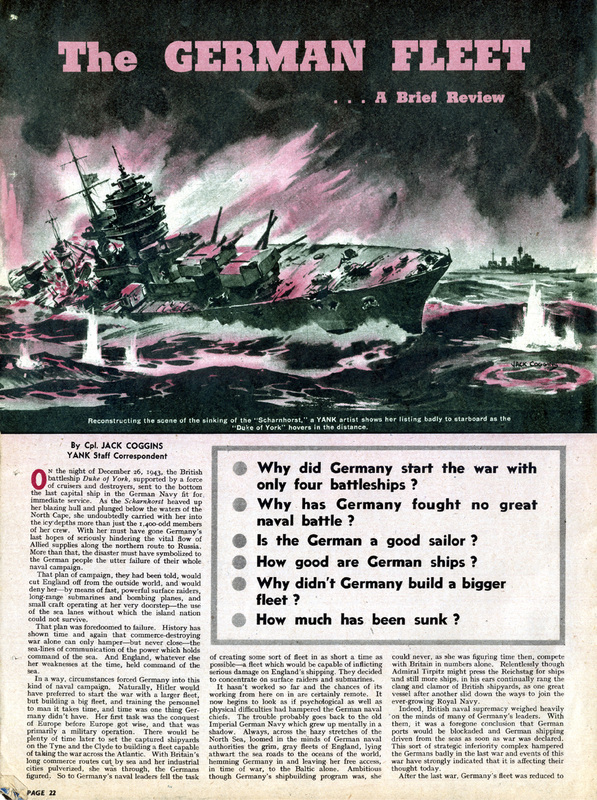 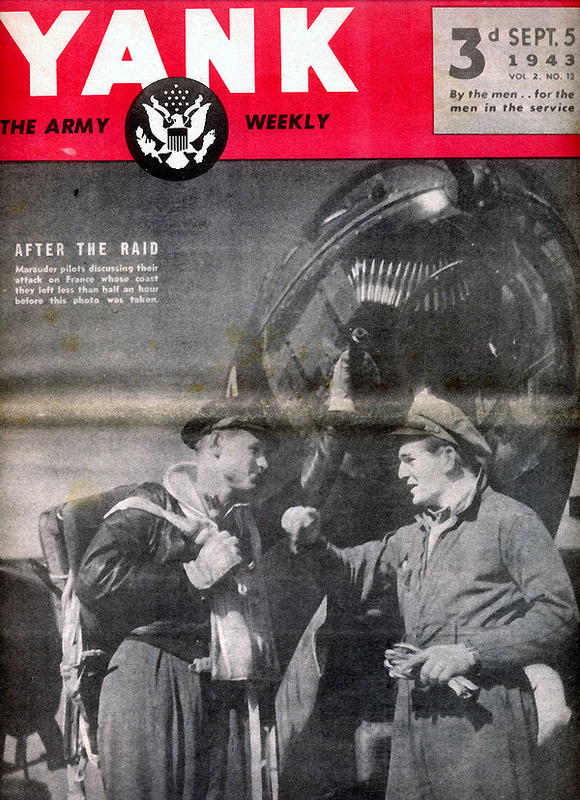 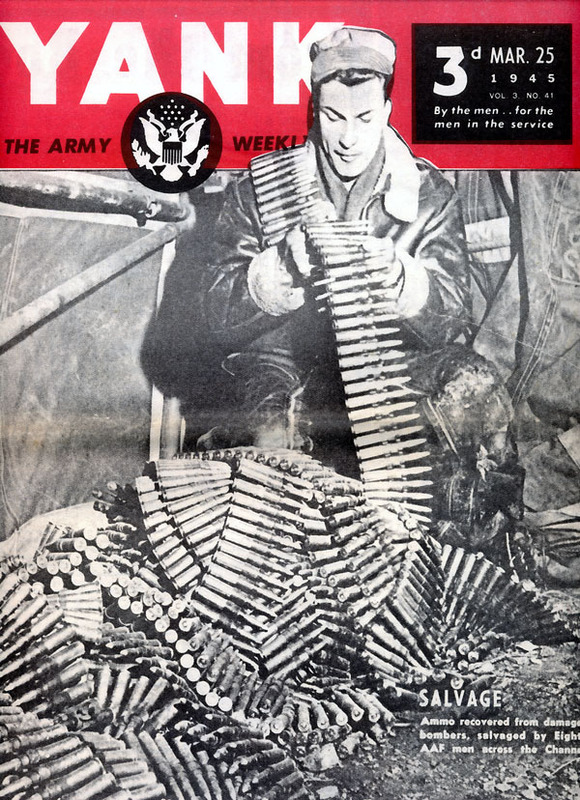 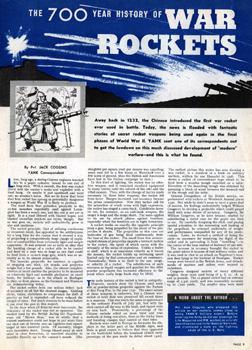 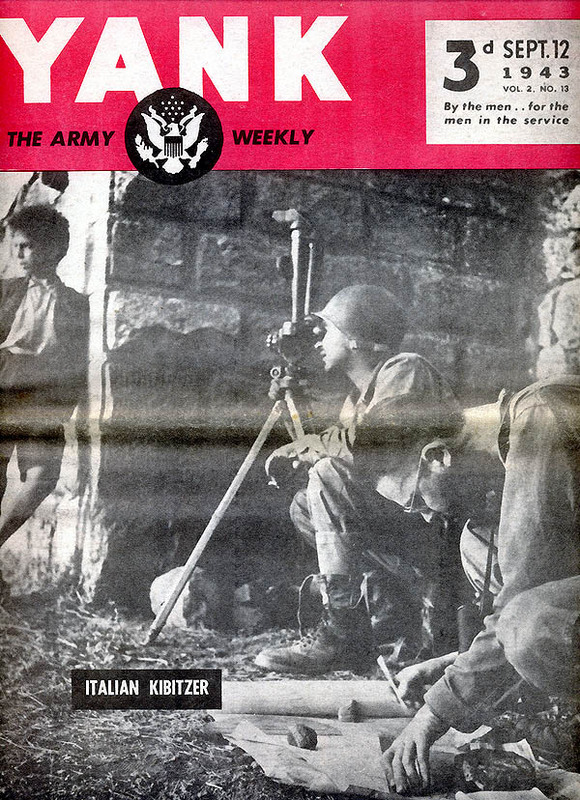 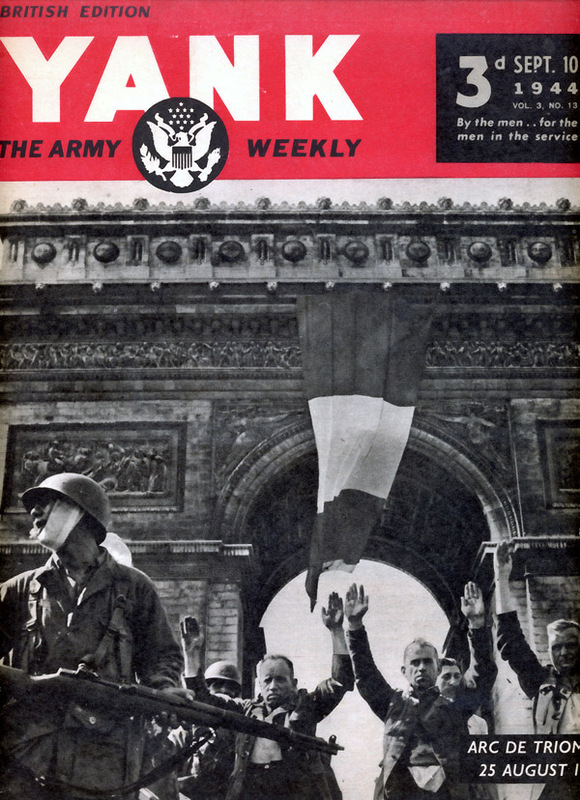 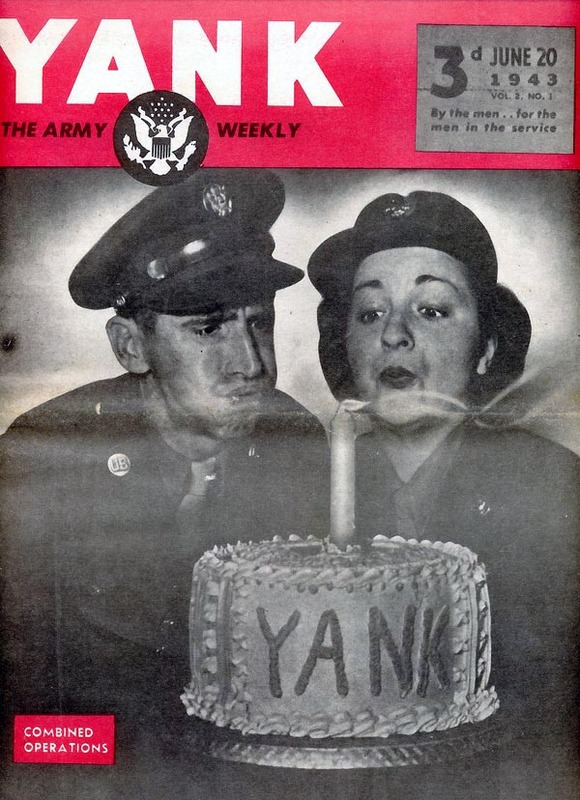 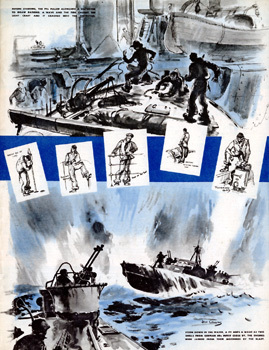 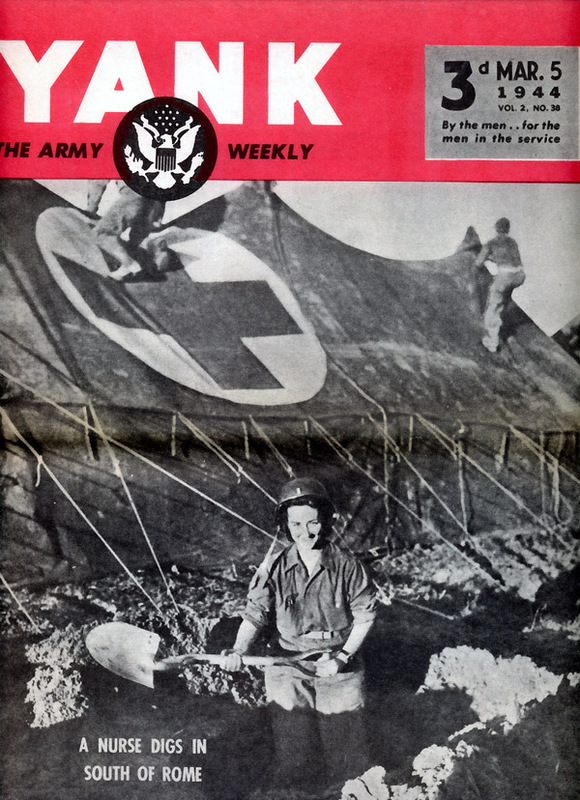 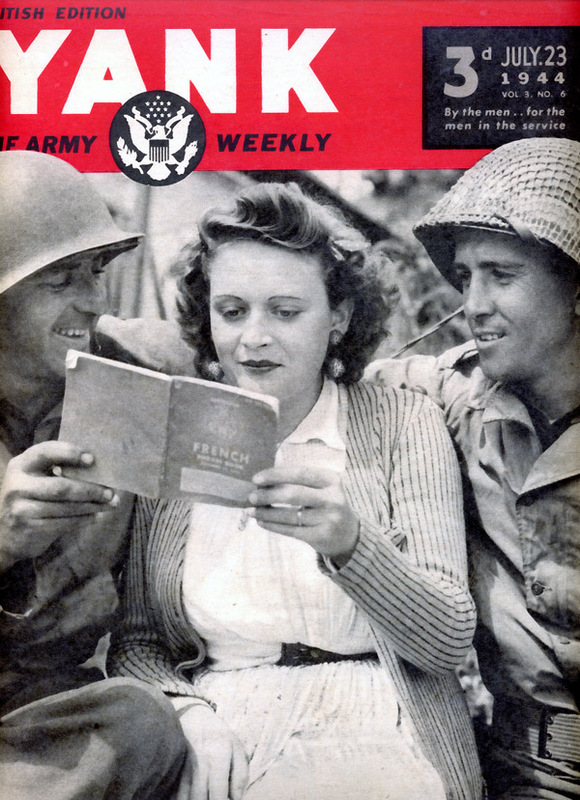 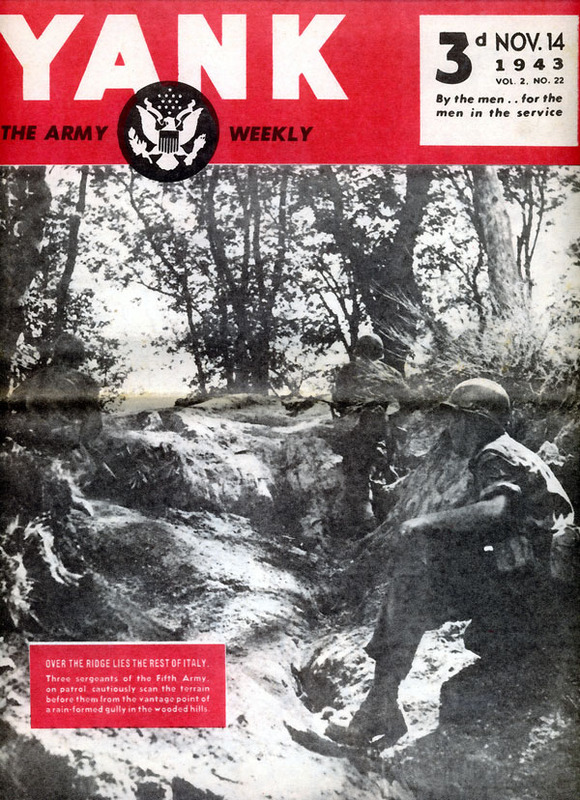 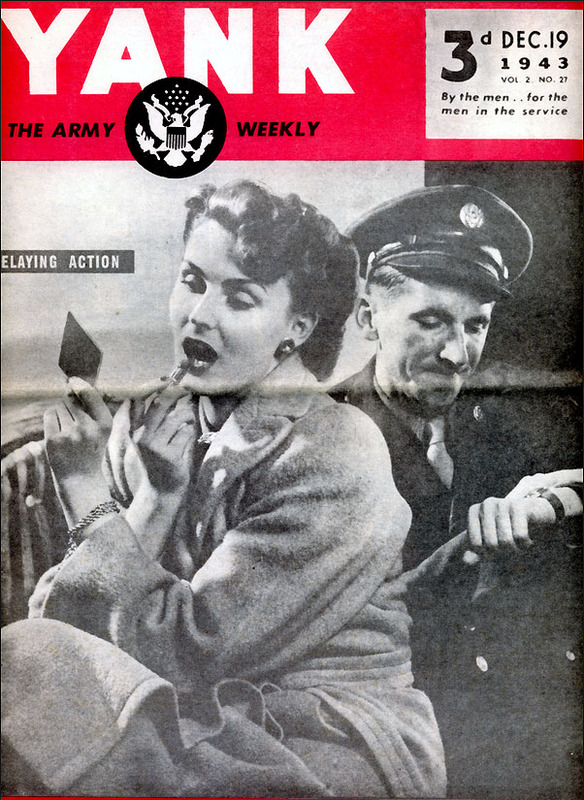 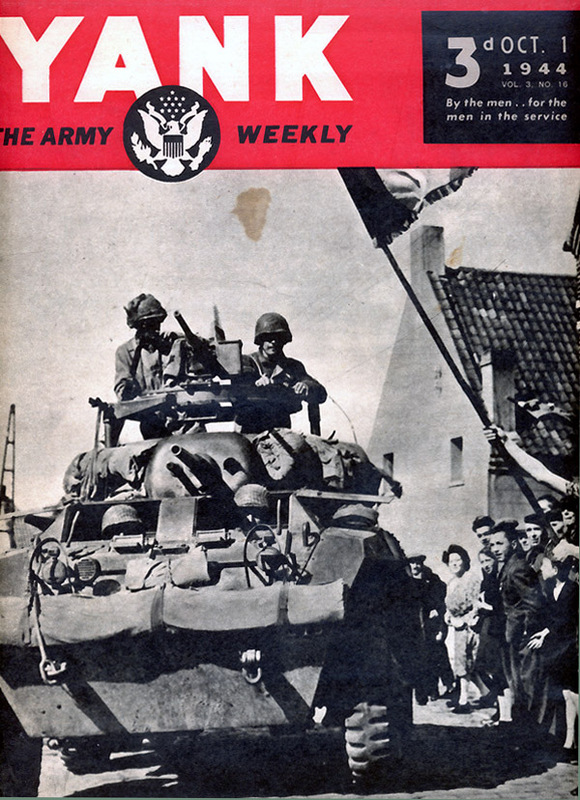 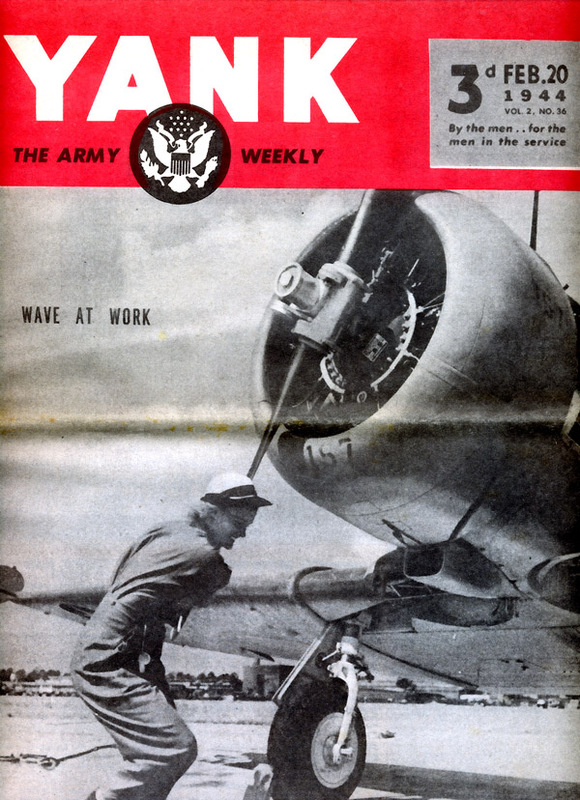 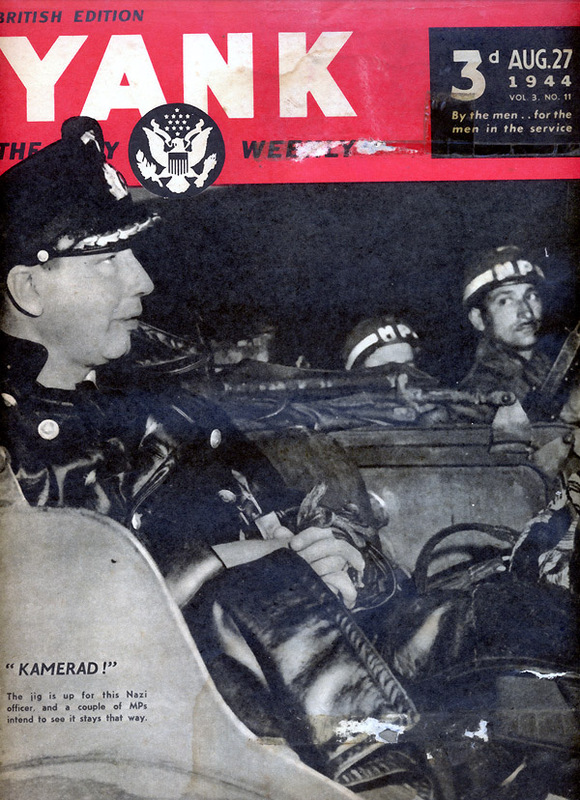 The US edition of YANK was published from June 21, 1942 to December 28, 1945 - approx 187 issues. On page 2 there is some additional information about YANK magazine or click here for a fuller review by Earl Rickard. 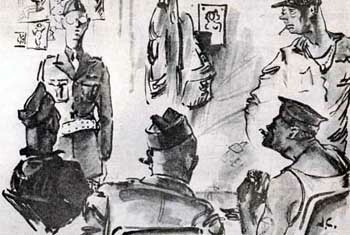 About 16 October, 1943 Jack was transferred to the London Office of YANK where he was to spend the majority of his war service; he was discharged on November 3, 1945. 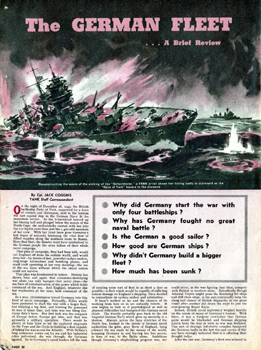 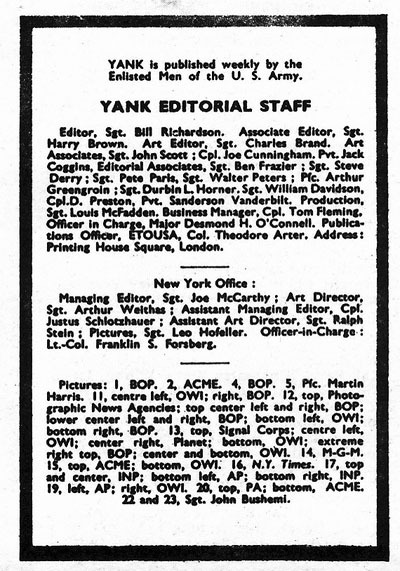 The British Edition of YANK was published from November 8, 1942 until October 5, 1945 (?) 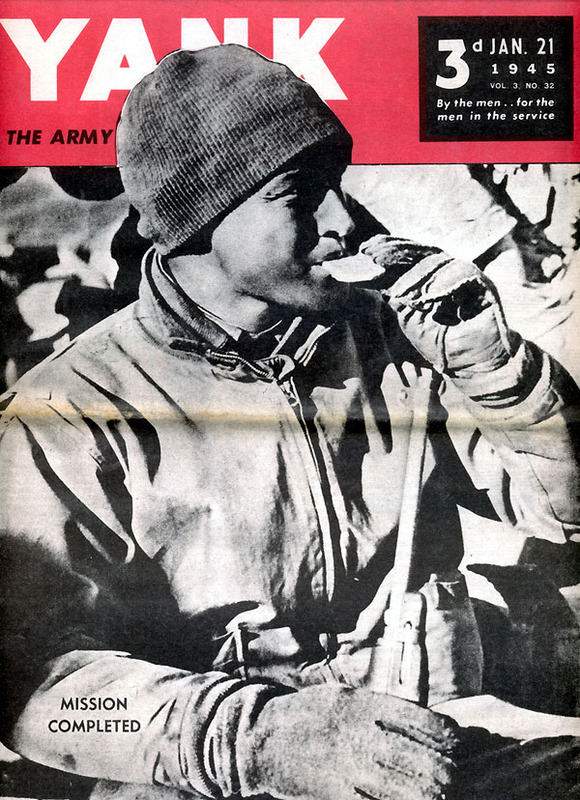 and he is officially listed on the British YANK staff from the November 14, 1943 issue as Pvt. 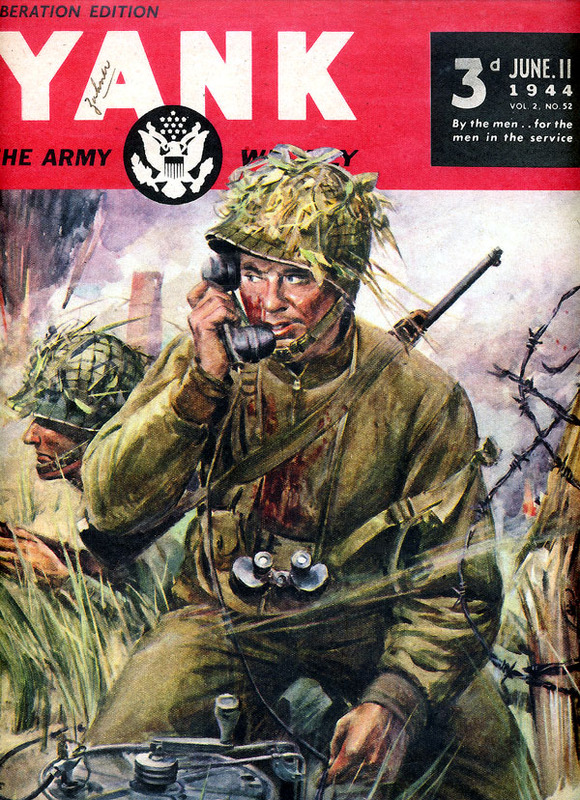 Jack Coggins, until he is finally listed as Sgt. 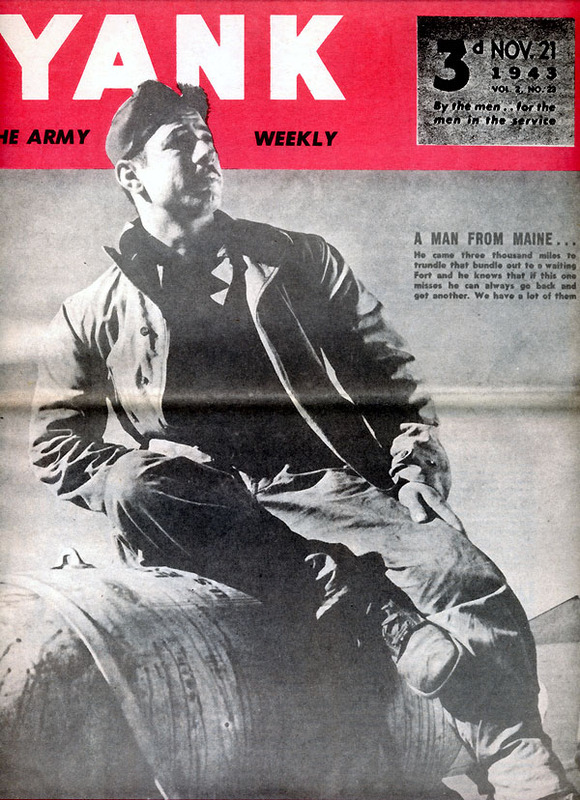 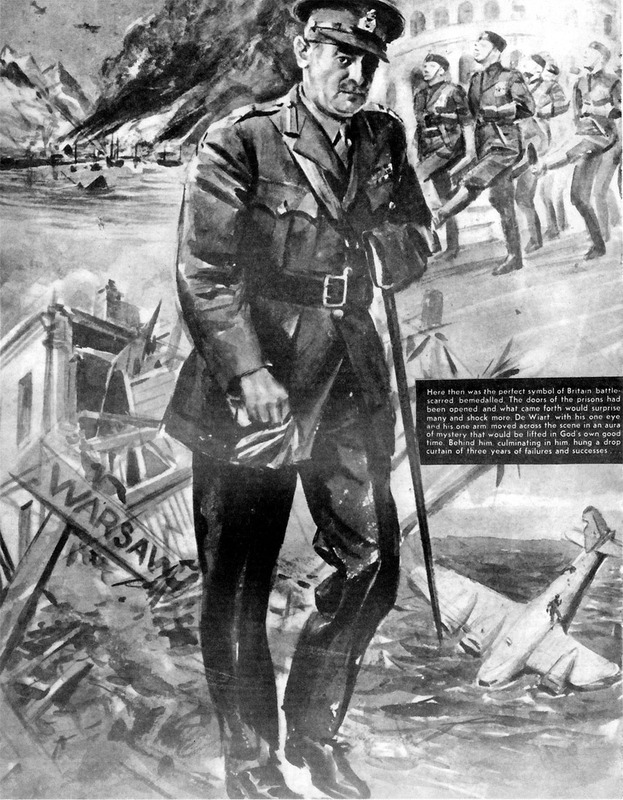 Jack Coggins in the August 31, 1945 issue. 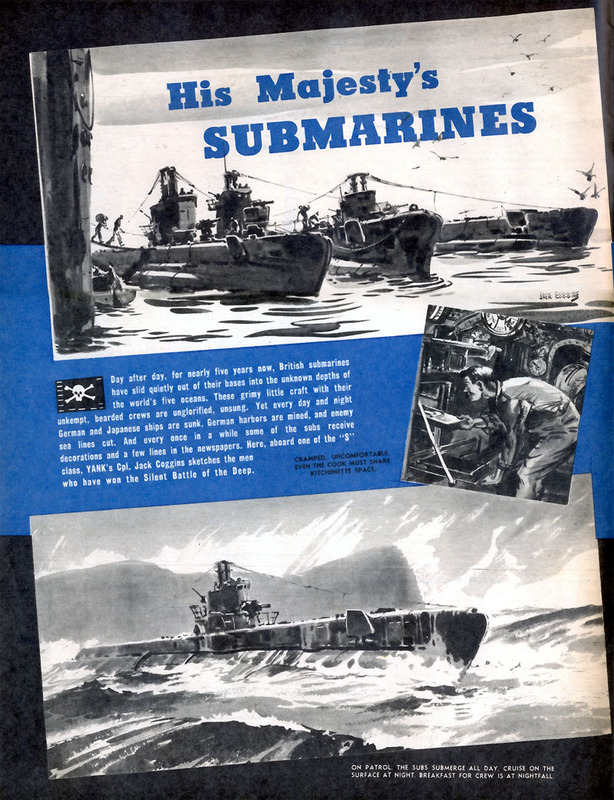 To date I have located 1 issue of US YANK and 25 issues of British YANK containing examples of Jack's work. 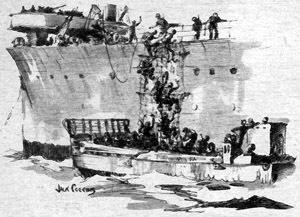 While in Britain, he spent time on a Royal Navy convoy in the North Sea, witnessed the bombing of St. 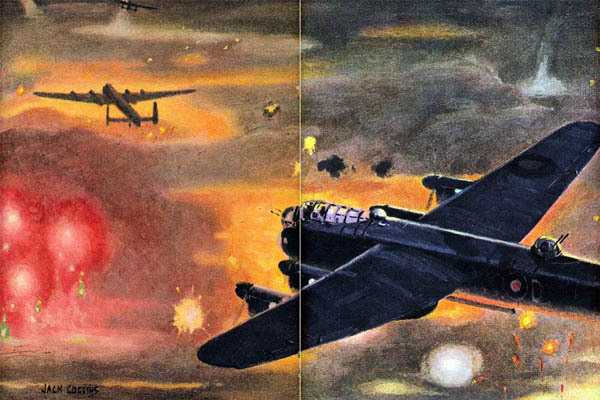 Lo, and flew over Berlin in a Lancaster bomber. 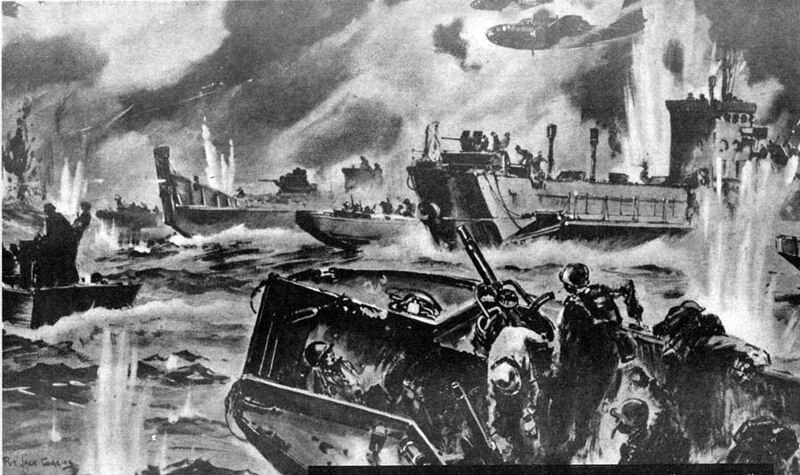 He also spent time on a U.S. PT boat patrolling the beaches and made a trip into Brittany with an armored column. 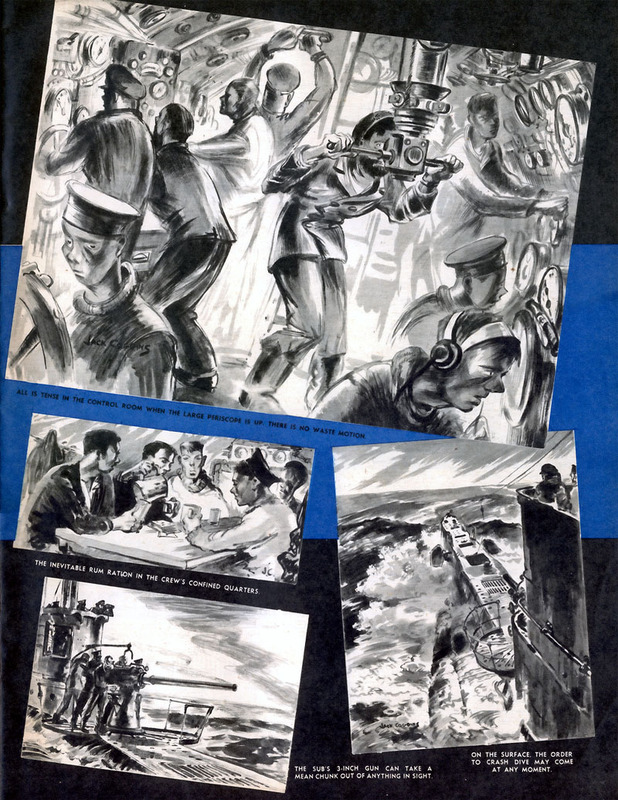 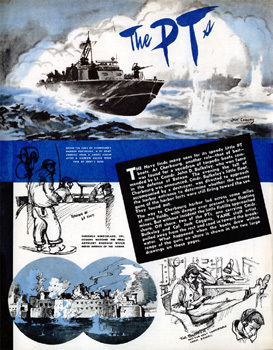 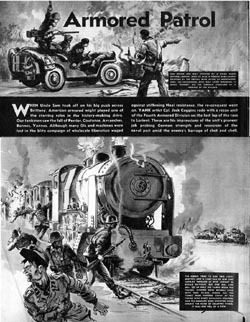 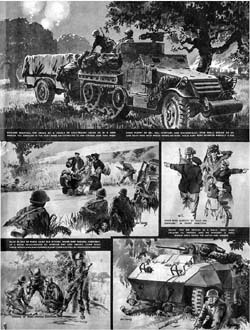 Action from all these campaigns was illustrated in YANK magazine in double page spreads, including the only 2 page full colour illustration ever published in YANK. 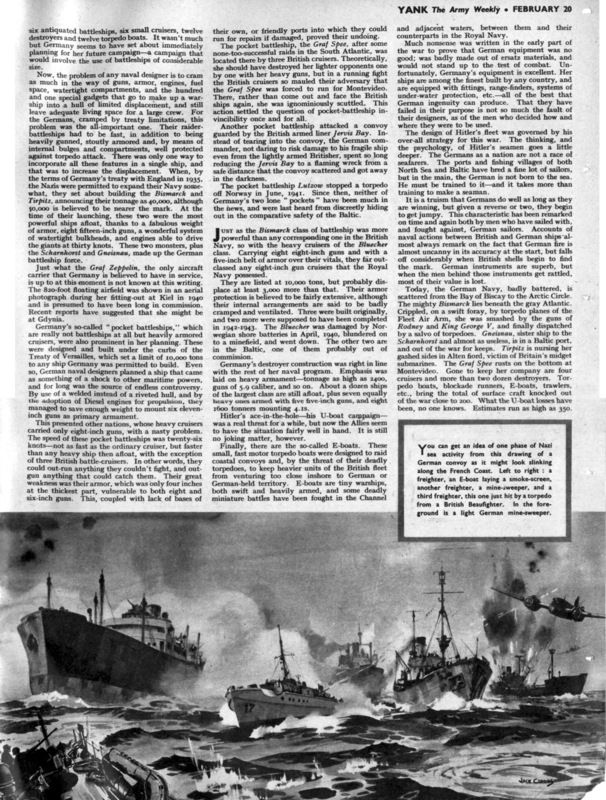 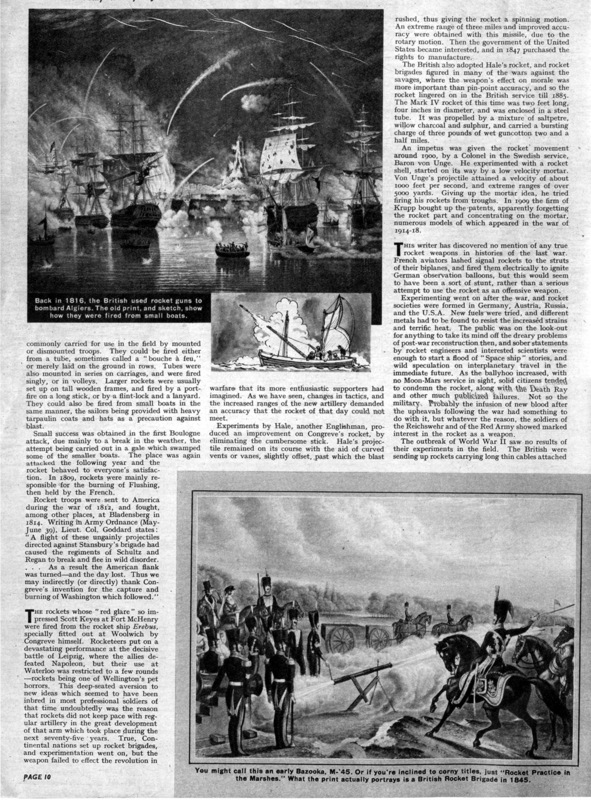 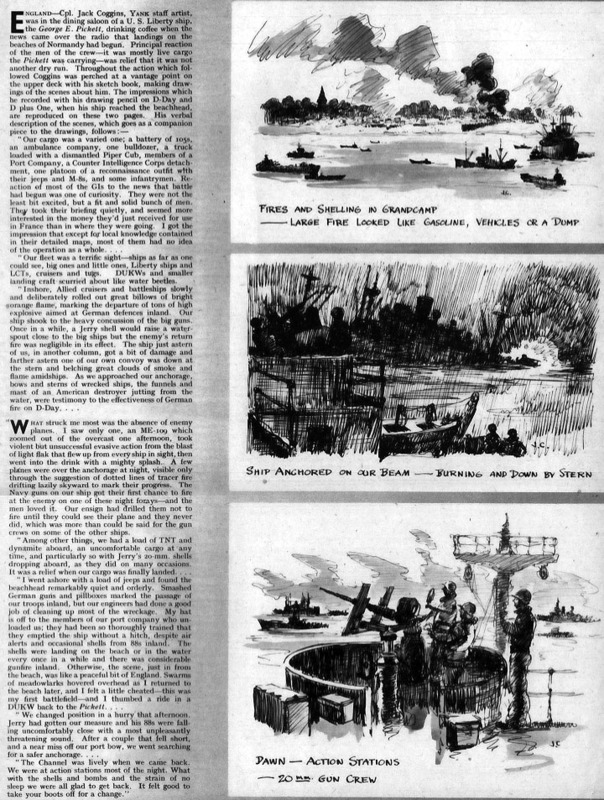 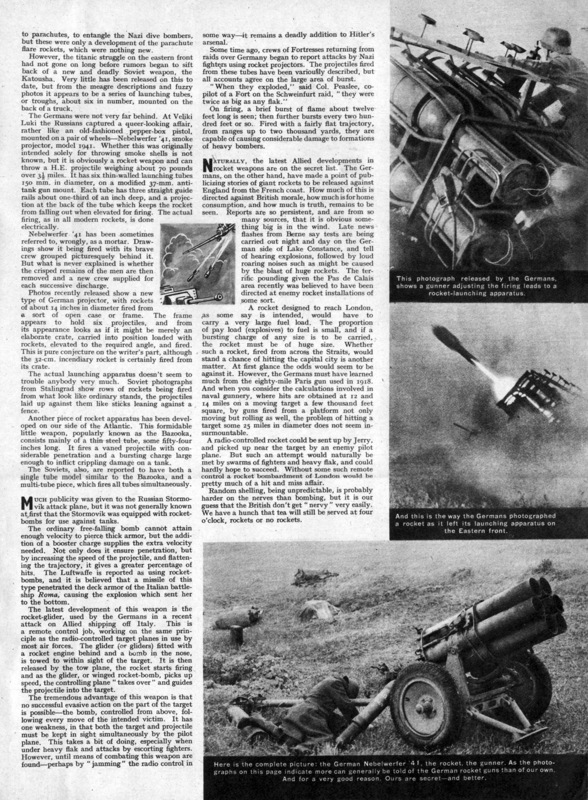 Jack also wrote and illustrated two articles published in British YANK, "The 700 Year History of War Rockets" and "The German Fleet - A Brief Review". Both of these articles show the writing style he used to such good effect later in his career, as well as the beginnings of his interest in rockets, which led to his famous space books. 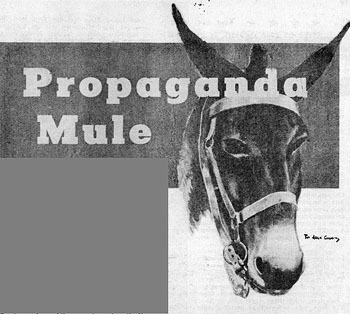 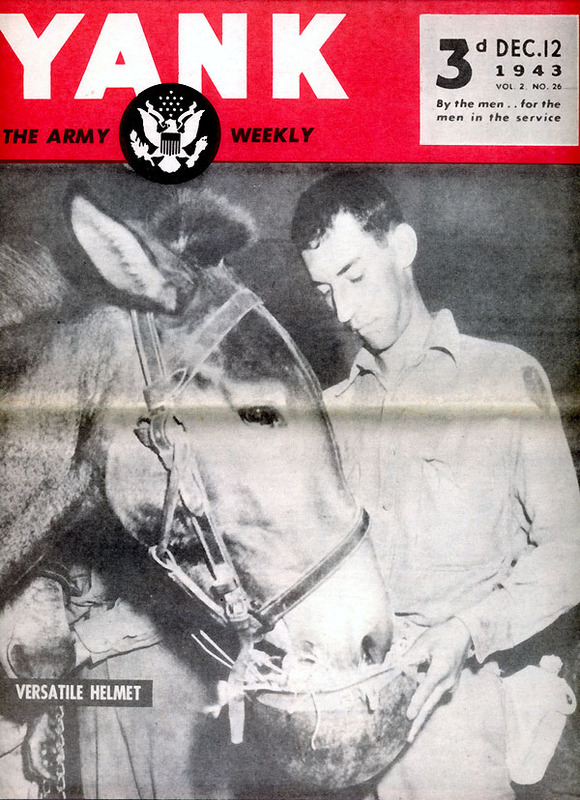 Above right is a photograph of Jack from the August 27, 1944 issue, showing a YANK pinup of Rita Hayworth to a horse. Click here to see more information about YANK magazine on Page 2 or continue down this page to see my collection of Jack's artwork from YANK. 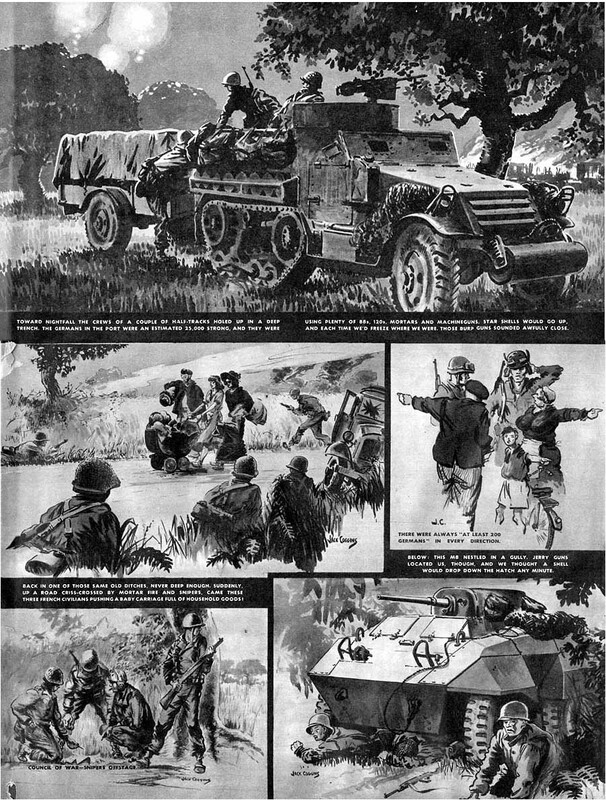 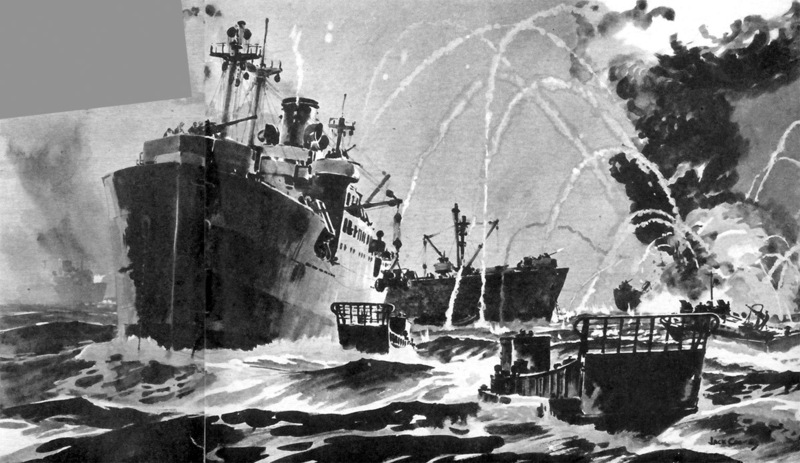 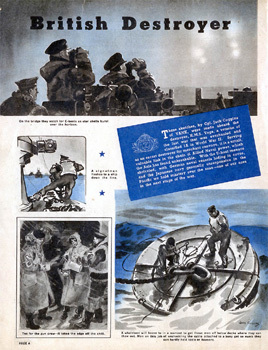 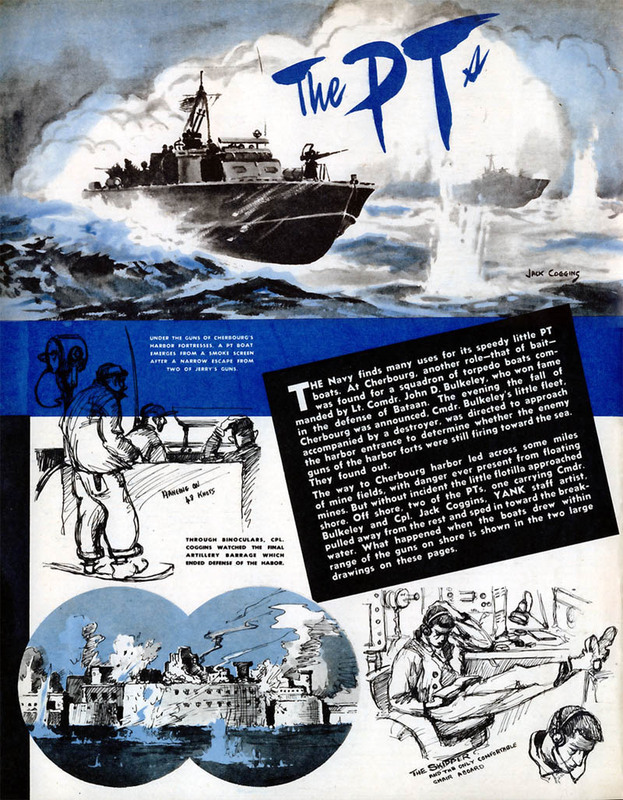 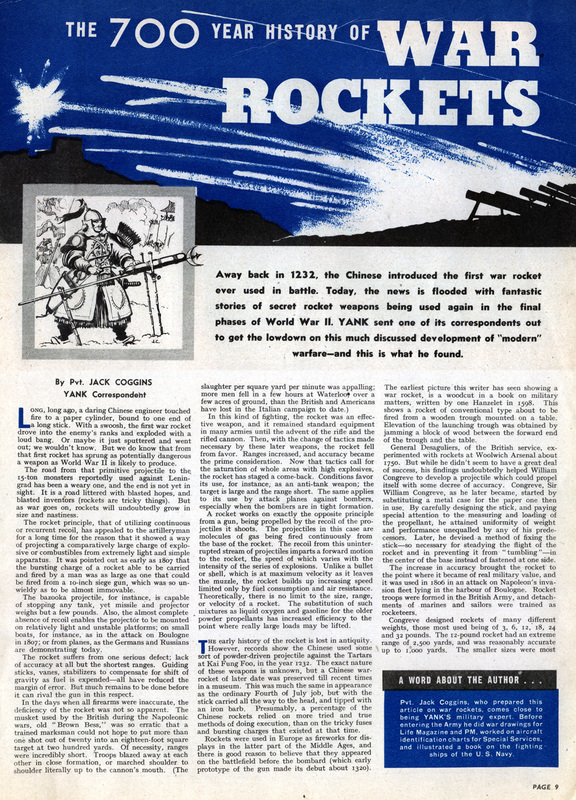 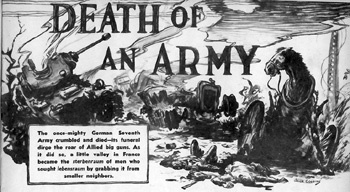 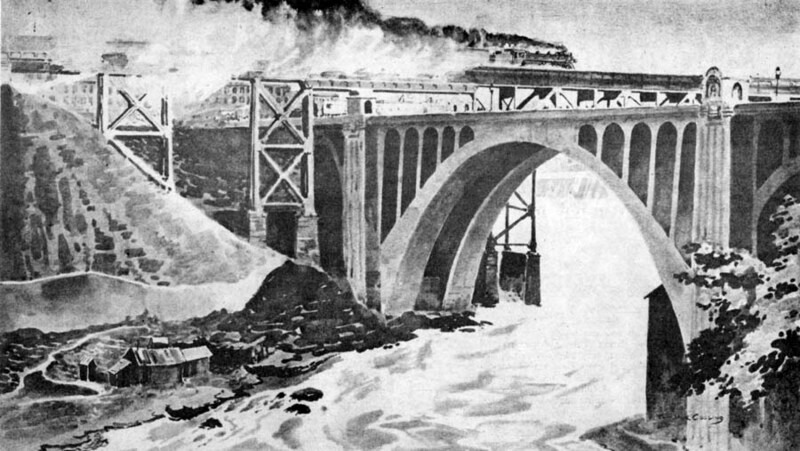 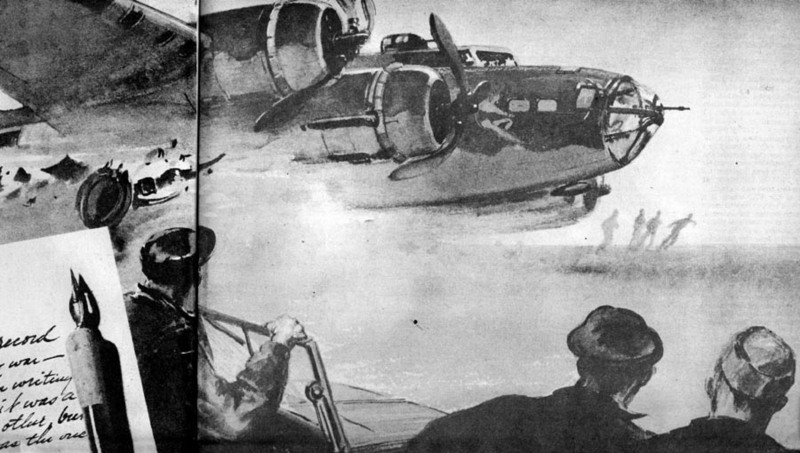 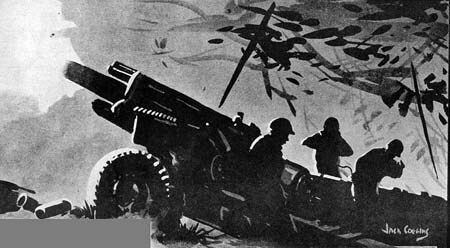 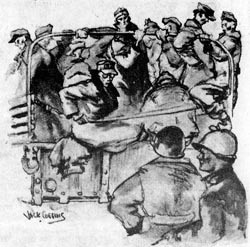 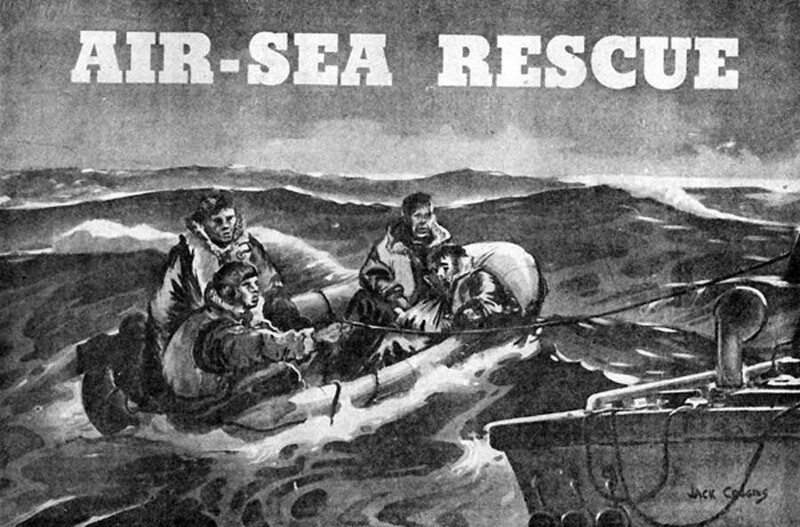 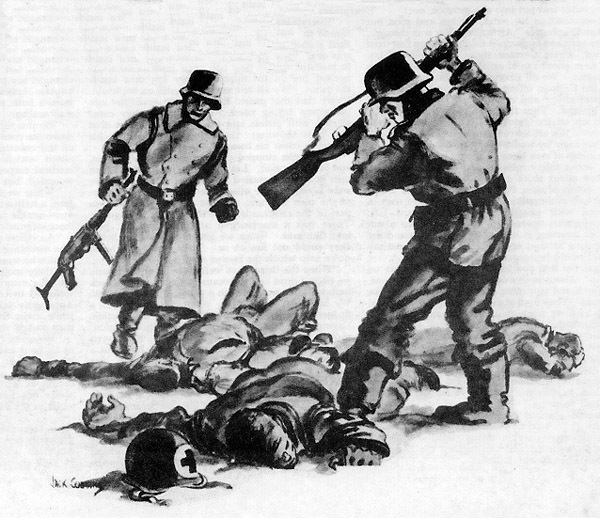 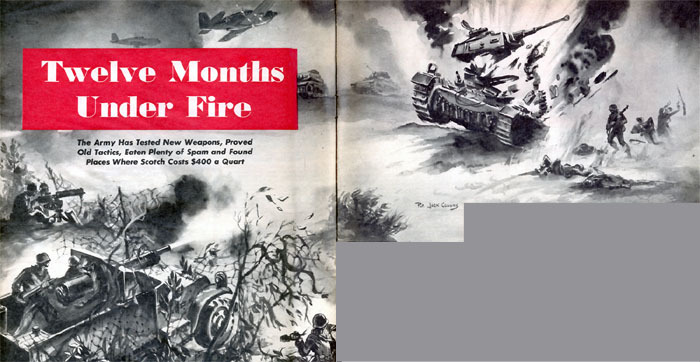 Illustrations for article "12 Months Under Fire"
Yank Magazine British edition Vol.2 No.1 June 20, 1943. 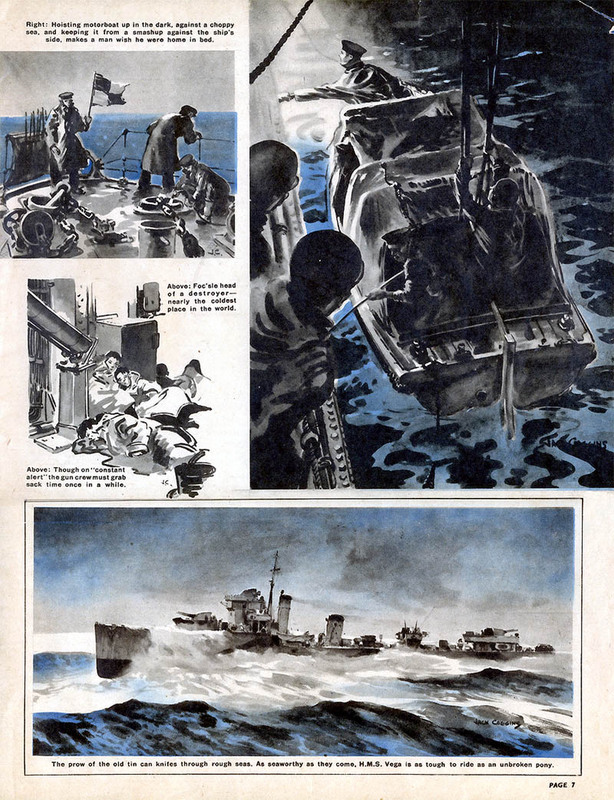 Pages 3-5. 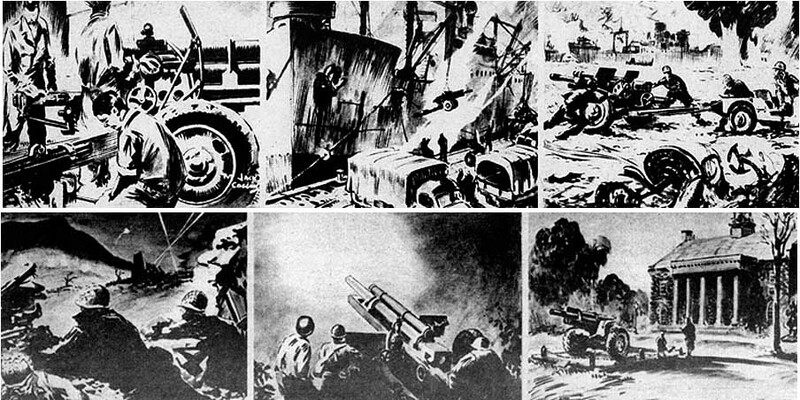 Earliest YANK illustrations by Jack found to date. 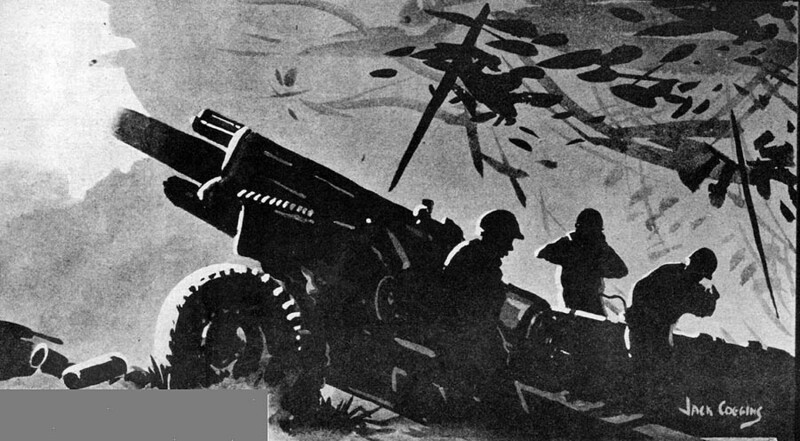 Illustration for article "The Gun"
Illustration for article "The Diary of a Flying Fortress Radio Operator"
Illustration for article "It Looked Easy on the Map"
Illustration for article "This Is What Happened"
Illustration for article "The Fall of Italy"
This unsigned illustration is part of the same article - it may have been done by Jack. Illustration for article "Spokane, Wash."
Illustration for article "Propaganda Mule"
Illustration for article "Sweating It Out"
Article "The 700 Year History of War Rockets"
Article "The German Fleet - A Brief Review"
Illustration for article "Air-Sea Rescue"
Illustration for article "Too Good for the Guardhouse"
Two Page Colour Illustration "Mission Over Berlin"
View the illustration caption here. Illustration for article "64 Hours of Battle"
Article "Across the Channel with the U.S. Merchane Marines"
View the text of the article here. 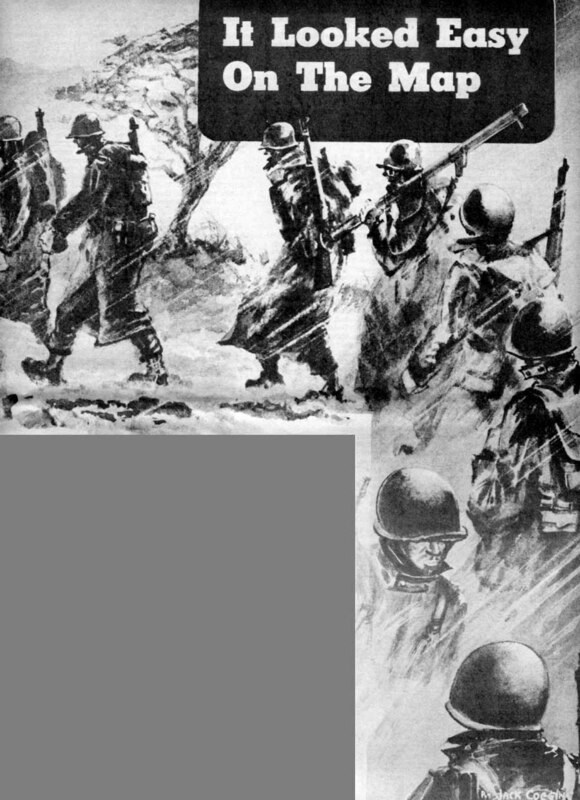 Illustration for article "Rommel, Count Your Men"
Illustration for article "Death of an Army"
Illustration for article "The Spearhead's TDs"
Illustration for article "Massacre at Malmedy"
Illustration for article "A German Talks"
Click here to see more information about YANK magazine on Page 2.